Benedict's Brother is the acclaimed novel selected as a Book of the Year in the industry press. This is its long-awaited release as an eBook. It is the inspiring contemporary story of young woman, Benedict, and her journey of self-discovery as she is asked by her uncle, a former Japanese prisoner-of-war, to scatter his ashes from the Bridge on the River Kwai in Thailand. She has no idea why but meets up with her estranged Buddhist monk brother, Antony, in a dramatic story of family love and personal transformation set against a backdrop of beautiful landscapes and golden temples. It is a story that will stay with you long after you have put it down. Benedict lives in York, UK and is alone after the death of both her parents and the departure of her motorbike-loving brother overseas. Out of the blue, Uncle Erno, a former Japanese prisoner-of-war, leaves Benedict a lot of money in his will with the request to scatter his ashes in Thailand. Benedict agrees to the request and sets off on a quest which throws her into a strange and challenging world of painful revelations the other side of the world. 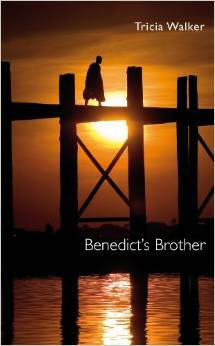 At times harrowing, but always beautifully written, Benedict's Brother has received tremendous praise and a loyal following. It is a publishing story that is equally compelling. Initially released as a blog following years of rejection, the paperback sold out its first print run in 6 months and was Borders' biggest selling UK launch of an unknown author with only Harry Potter and The Deathly Hallows selling more in store on launch night. It is a truly inspirational story of love, life, loss, music and Harley Davidson motorbikes, currently in development as a movie. Tricia Walker is a Yorkshire born author who currently lives in Bournemouth on the UK south coast. Writing from an early age words played a large and defining part of family life, her father Peter came to prominence as the writer of the Constable series of books, which were the inspiration for the hugely popular and long running ITV drama Heartbeat. Benedict’s Brother is Tricia’s first novel. She is also script consultant and producer on the movie of Benedict’s Brother currently in development. Kindle Price: £3.59 includes VAT* & free wireless delivery via Amazon Whispernet (* Unlike print books, digital books are subject to VAT).